Director Neil Marshall’s Hellboy reboot is a textbook example of the kind of film where, as you’re watching it in theaters, you can still pick up on the echoes of what it was or might have been earlier in the production process—perhaps when the studio was still considering who should helm the project, or which actors would be best to bring the characters to life. Sometimes, this can work in a movie’s favor. More often than not, though, it’s a major distraction that draws attention away from the story being told, and makes you begin to look for other cracks in the film’s narrative substance. The new film opens with its titular demon hero (Stranger Things star David Harbour) well into his career working at the Bureau for Paranormal Research and Defense (B.P.R.D.) with his adoptive father Trevor Bruttenholm (American Gods’ Ian McShane). Along with others, they hunt and detain the kinds of magical creatures who pose threats to humanity’s existence. At this point in his life, Hellboy’s no stranger to taking out his demon brethren with ease for the sake of the world but, despite having the physicality of a hulking, grown man from the bowels of the underworld, he’s still relatively young—an immature teenager by demonic standards—and just as petulant as any other kid who’s forced to work alongside their parents. The moment Harbour appears onscreen as Hellboy, he definitely sells himself as the character much in the same way Ron Perlman did, both because of his solid take on the character’s personality and the impressive amounts of makeup that went into crafting his devilish appearance. As much as we all enjoyed del Toro’s Hellboy films, you can’t deny that the Hellboy costume department stepped its game up and then some with its approach to creating a demon who looks, feels, and moves like a believable being with minimal CGI help. Hellboy’s relationship with his human father is a key part of the character’s identity because Bruttenholm is the person responsible for giving Hellboy an initial introduction to humanity. Despite the fact that Hellboy is destined to bring about the apocalypse, Bruttenholm loves his son and wants only the best for his monstrous, misunderstood boy. But because Hellboy’s a film that abhors the idea of showing us things and would rather have characters explain them in order to move on to the next, blood-soaked, lifeless scene, we don’t actually see much of Bruttenholm and Hellboy’s father/son dynamic. Instead, the film’s much more focused on beating you over the head with a selection of greatest hits moments from the Hellboy comics, hoping that you’ll get so swept up in the blood and gore that you mistakenly think you’re having a good time. There’s scarcely enough time to actually drink in what the movie’s serving up as it hops from scene to scene in a way that feels as if Hellboy’s trying to make sure you can’t get a solid lock on it. As far as the film’s main drama goes, after a failed attempt at unleashing a magical plague upon the world, the Blood Queen witch Nimue (genre mainstay Milla Jovovich) returns to the world of the living with a vengeance and every intention of finishing her important work of transforming the planet into a new Eden for demonkind. As Nimue, Jovovich is at her very most Jovovich—grinding chewed-up scenery she’s long since spat out beneath the heel of her foot with the ease of someone who’s familiar with being dropped into the midst of spectacular, cinematic train wrecks. At times, Nimue is every bit as boring and silly a villain as Suicide Squad’s Enchantress, but whenever Jovovich actually has to deliver lines directly into the camera, she does her damnedest to make the character as intimidating as humanly possible. When Nimue encounters Hellboy for the first time, she realizes she’s in the presence of demonic greatness and that together, they’d be able to achieve a kind of power neither of them could have ever imagined. But again, Hellboy never slows down enough for those kinds of revelations to mean much of anything, which is a disappointment given you can tell that the film’s actors are perfectly capable of embodying the roles they’ve been tasked with. It’s just that none of the characters are written in a particularly interesting or compelling way. Hellboy’s joined in his quest to stop Nimue by Alice (Sasha Lane), an old friend of Big Red’s who was left with empathic powers after being kidnapped by fairies as a child, and Ben Daimio (Daniel Dae Kim), a gruff B.P.R.D. agent with a grudge against anything that isn’t of the human world. Together, the trio’s meant to be a ragtag group of misfits who are better off with one another than they know, and they are, but whatever chemistry Harbour, Lane, and Kim have with one another gets lost in the deafening cacophony of Hellboy’s overall messiness. And it has no bearing on the film’s plot, but Daimio’s role in the story is so exceedingly small that claims of the character originally being whitewashed in order to give him “an English background” are laughable. While Guillermo del Toro wasn’t at all involved in the production of the movie, you can feel the ghosts of his Hellboy films haunting this one in the most unfortunate of ways. 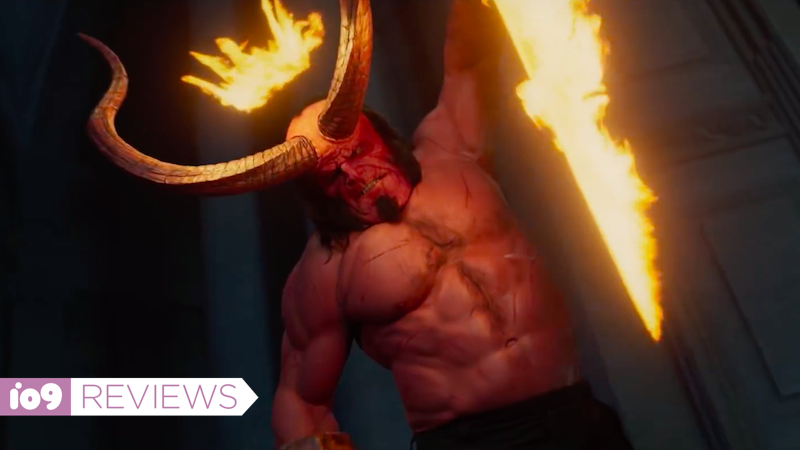 While Lionsgate initially pushed the idea of this Hellboy’s R-rating being a necessary part of its story being equal parts horror and fantasy, the end product isn’t scary as much as it is gross. Because the story doesn’t imagine that demons trying to wipe humanity out as scary enough, the film ladles on excessive amounts of gratuitous bloodshed that, after a while, fail to get your heart rate up. There are only so many times you can be horrified to see someone being torn in two before you get bored and start thinking about what all that fake blood might smell like. Like two great tastes that somehow don’t go well together, Hellboy’s greatest sin is that it makes you long for the film that it might have been because there’s so much about the movie that works in a vacuum. David Harbour absolutely nails the charming, lunk-ish aspects of Hellboy’s personality, and a handful of the film’s action sequences are legitimately fun to watch before you get back to the slog of the rest of the film. Sadly, those few bright spots aren’t likely to convince anyone that this reboot deserves to be a jumping off point for a new series or doing the Hellboy franchise any favors. Hellboy hits theaters April 12.